An extraordinary discovery, an installation of the II millennium B.C., has come to light in Longola – Poggiomarino, a few kilometers north-east of Pompeii: an archipelago formed by islets and artificial channels that allow to suppose the meaningful existence of a river harbour on the Sarno. The excavation, directed by Soprintendenza Archeologica di Pompei for the study of the territory in relationship to the construction of the depuratore on the river Sarno, is progressively showing a habitations superimposed one to the other, datable from the II millennium B.C. up to the whole VII century B.C..
It’s the first time that in Campania it is noticed a continuity of installation from 1500 B.C. to 700 B.C. with the presence of palafitte, recovered till now only in the North Italy. Discoverings that open new sceneries and interpretations of the history of the whole southern Italy. The place is characterized by small islets delimited by channels, the edges of which have been strengthened with trunks of tree thickened vertically, then replaced by square beams. 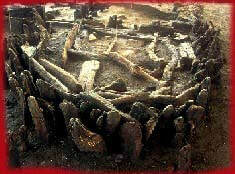 The surface of the islets, improved and raised again with varied techniques during the centuries of installation, preserves the rests of the huts and varied furnishings that confirm the presence of a community devoted also to the workmanship of the bronze and the amber. 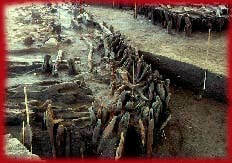 The place, according to a first reconstruction of the researchers, has been abandoned, because of a flood, at the beginning of the VI century B.C. ; and it is really from the migration of these inhabitants and of those of the superior valley of the Sarno that the ancient Pompeii could have been born. The site, that is stretched on a surface than at least 7 hectares, appears as one of the discoveries with most relief in the last 50 years. It is attested in fact a housing continuity of almost a millennium (XV - VI century B.C.) that it doesn't find comparisons in the panorama of the history in Campania and that results an exceptional case within the European history. For the first time, it is individualized and dug out, in fact, an installation area coeval to the graves of the age of the iron in the valley of the Sarno (IX - VII century B.C.) and that fills the cognitive gap between the initial phases of the age of the bronze, recovered in a large extent of Campania and testified besides in this zone from the villages of Nola, Palma Campania and Sarno and the foundation of Pompeii (beginnings of the VI century B.C.). The installation typology appears of extreme interest with the occupation of reserved areas, real islets, results of work of canalization and reclamation that attest an elevated knowledge of hydraulic engineering and a careful selection of materials used for the realization of housing structures. The exceptional state of maintenance of the woods finds comparisons only with some lake and river sites of northern Italy and continental Europe and has allowed the recovery of a canoe. The quantity and the quality of the finds, united to the recovery of numerous semi-manufactured objects and of discards of workmanship (of bronze, iron, amber and glassy pasta) make Poggiomarino an important center of production and exchange of prestige goods. Particularly interesting are the data that allow to reconstruct the ancient environmental picture characterized from the presence of thick woods of oaks and the abundant wild fauna (wild boars, bears, roe-bucks, bucks).